SINGAPORE - Friends and family members of Miss Kathy Ong, who died in a car crash on Thursday (April 19), remembered her as a caring and fun-loving teen who enjoyed nature and was passionate about environment-related issues. 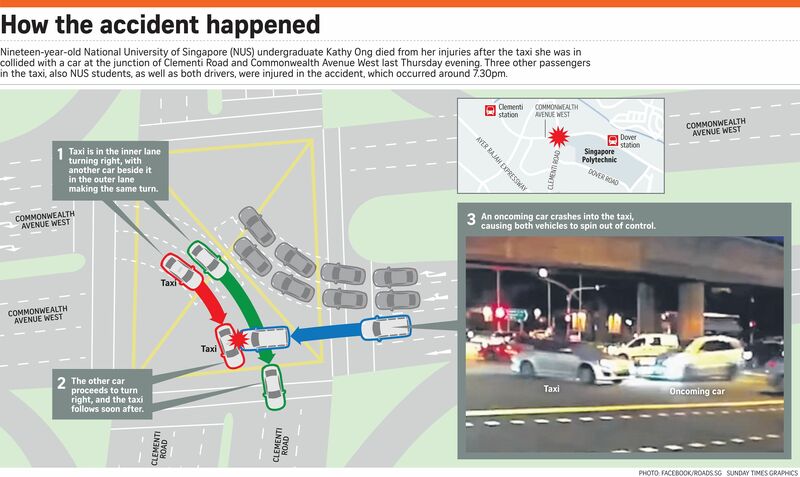 Miss Ong, 19, was a rear-seat passenger in a taxi with three other friends when it was involved in a collision with a car at the intersection of Clementi Road and Commonwealth Avenue West. Hundreds of friends, mostly from the National University of Singapore's (NUS) Tembusu College, gathered to pay their condolences to her family at her wake on Friday and Saturday. It was held at the Church of St Teresa in Kampong Bahru, where Miss Ong was baptised, and where she felt "most at peace", said her mother Jacqueline Ong, 45. "We were very close as a family. We talked a lot, she's very open, and discusses everything with me," she told The Straits Times. The environmental studies undergraduate, an only child, was in her first year of university, and was a resident of Tembusu College, where she and her friends were headed on Thursday night. Both drivers and the four students were taken to the National University Hospital, where Miss Ong died. Her three friends are still in hospital, with unspecified injuries. "She would come home during the weekends and tell me all about her modules, her friends, her life in Tembusu," said Mrs Ong. Her friends remembered her as a genuine, friendly and fun-loving individual who enjoyed the occasional prank. "Once, she made cookies out of cricket flour and fed them to us without telling us," said a friend. "She told us only after we had finished eating." Miss Ong kept a busy and active schedule in school even as a first-year student, joining various school committees. "She was the nicest person in Tembusu - the nicest person I know," said another friend, who also declined to be named. "She was someone who put others before herself." Miss Ong had a very generous spirit, she added. "Even if she was busy and you came to her with a problem, she would drop everything to listen to you." Miss Ong appeared to be a conscientious student who had mapped out all the modules she wanted to take in her four-year course, and had wanted to pursue something wildlife-related after graduation. Another girlfriend remembered her as a filial child who was extremely close to her parents. "Everything she did, she had her parents in mind," she said. "She would talk about them all the time. We could all tell they meant a lot to her." Mrs Ong said her daughter took after her. "We have similar characters. My friends and colleagues who know her all say she talks like me. Not many people can make me laugh, but Kathy was one of them. She said, 'that's because you enjoy intelligent jokes'. "She is my source of joy."